Fax software is helping today’s businesses enjoy all of the benefits of faxing – without the need to have a real fax machine in their office. Let’s face it: fax machines are expensive, large, and annoying to maintain. They’re not nearly as necessary as they were in the 1980s – but many businesses still rely on fax machines every day. RingCentral is the most popular fax software for businesses and entrepreneurs. A quick glance at the company’s prices will tell you why: the cheap prices and high monthly allotments are great – but they become even more attractive once you realize that RingCentral has more features than any other online fax software company on this list. Electronic signatures are one of the most popular RingCentral features. Out of all the other fax software on this list, only eFax offers digital signatures. Why are digital signatures important? It’s one of the biggest advantages of online faxing service. Typically, you’d have to print off a fax, sign it, then re-scan it and fax it back. With fax software + digital signatures, you can add a verified signature electronically using your computer or mobile device and send the fax back in seconds. It’s incredibly useful for businesses that do a lot of business over fax machines (or work with lawyers who like to send documents via fax machines). But the true value of RingCentral comes from its ability to bundle the fax software with cloud PBX and calling systems. RingCentral isn’t just a computer faxing company. Instead, they’re primarily a communications company that helps businesses install things like VOIP networks and cloud PBX systems. These services start at around $25 from RingCentral. Most packages include online faxing free-of-charge. That’s important for many new businesses. If your business has grown to a point where you need a PBX system and online faxing, then you can save bundles of money by ordering from RingCentral. The fact that RingCentral integrates with Microsoft Outlook and Office is also important for many businesses and entrepreneurs. It means you can use your existing email client – and your existing Office document formats – to easily send and receive online faxes. You don’t need to convert your Word docs to PDFs, for example. Fax 1000 ($12.99 Per Month): Includes 1000 sent and received pages per month ($12.99 per month annual rate). Fax 2500 ($59.99 Per Month): Includes 2500 total sent and received pages per month ($49.99 per month annual rate). Fax Unlimited ($49.99 Per Month): Includes unlimited faxes per month as well as a dedicated fax number for each employee ($39.99 per month annual rate). RingCentral is the most popular online fax software for small businesses for good reason. It’s packed with valuable features, has an easy-to-use interface, and can be bundled with PBX and VOIP systems for maximum savings. The plans are also big enough to scale from small businesses to larger corporations – so RingCentral can grow with your business. Nextiva is the best choice for business owners and entrepreneurs who need to fax to/from North America and don’t need lots of bells and whistles. Nextiva is incredibly affordable, with a basic plan that includes 500 sent/received faxes per month starting at just $4.95 per month on an annual subscription. If you’re looking for cheap online faxing services, you won’t find a cheaper service than Nextiva. The cheap price comes with a cost. You won’t be able to fax international numbers outside of the United States or Canada with Nextiva. The other electronic fax software providers on this list all offer international faxing (although you have to pay various long distance fees). For some businesses, the lack of international faxing is a deal breaker. Others, however, won’t really notice the difference. If your business has no international clients, customers, or suppliers, then there’s nothing to worry about. Whether you sign up for an annual subscription or you’re going month-to-month, Nextiva is still the cheapest option on this list. Some of its competitors like MyFax and eFax charge twice as much for less than half as many included faxes! Of course, even if you do go over your Nextiva monthly allotments, you won’t be paying too much in added fees. The company offers 3 cent overage fees on all extra pages sent and received. If you don’t need electronic signatures, international faxing, or flashy mobile apps and web-based UIs, then there’s absolutely nothing wrong with Nextiva. It’s the most cost-effective option on this list and is an excellent choice for businesses and entrepreneurs who need to exclusively fax other American and Canadian businesses. 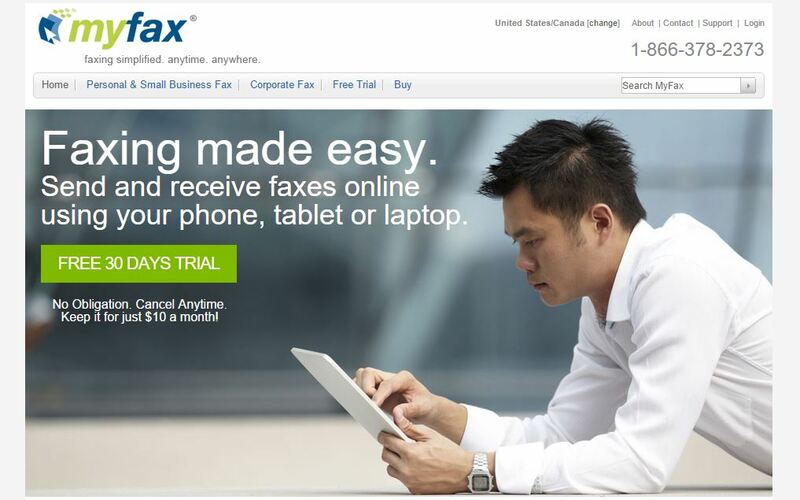 MyFax plans start at $10 per month. At that price, you can send 100 faxes and receive 200 faxes. That’s relatively low compared to other providers listed here at that price range. However, MyFax somewhat makes up for it by offering a range of features that include international faxing, full Outlook/Office support, and the ability to send faxes to multiple recipients simultaneously. The only major feature missing from MyFax is the ability to add digital signatures. That can be a deal breaker for some businesses. With digital signatures, you can add a verified signature to your faxes without needing to print it off or use third-party software. MyFax does not yet have that feature. MyFax’s overage charges are also relatively steep, clocking in at 10 cents per page. That can add up quickly. The lack of digital signatures is a deal breaker for some businesses. The low monthly allotments and high prices are also a deal breaker for others. But if neither of those things really matter to you, then MyFax offers plans that can scale to meet the needs of your small to medium-sized business. eFax is one of the two fax software systems on this list that supports digital signature (RingCentral is the other one). If your company regularly needs to add a verified signature to faxed documents, then this can make the higher average costs of eFax worth it. eFax is likely the most expensive fax software on this list. Prices start at $16.95 per month and include about 250 sent/received faxes per month. For some businesses, that’s more than enough. But others will appreciate the lower cost per fax of services like Nextiva and RingCentral. Nevertheless, eFax makes up for it with the most extensive feature set we’ve seen outside of RingCentral. Plus ($16.95 Per Month): Receive up to 130 pages per month/Send 130 faxes per month (Overage fees are $0.15 per page for received pages, $0.10 per page for sent pages). Pro ($19.95 Per Month): Receive up to 200 pages per month, send up to 200 pages per month (Overage fees are $0.10 per page for both sent and received pages). Some businesses and entrepreneurs don’t mind paying a little extra money for better service. If that’s the case with you, then eFax might be a perfect fit. You pay about twice the price as other fax software and have fewer than 200 allotted sent/received pages per month. However, you get features like digital signature support, file sharing, and the best software UI in the industry. MetroFax is a popular basic fax software for businesses and entrepreneurs. With plans starting at $7.95 per month, MetroFax competes with Nextiva in terms of its cheap price tag. Unlike Nextiva, however, MetroFax lets you send and receive international faxes. So if you want a cheap online fax software that doesn’t cut out international faxing, then MetroFax is a good choice. The only other major features you lose are the digital signature support and the polished UI. If neither of these things matter much, then MetroFax might be a good fit. If you want cheap fax software and need features like international faxing, then MetroFax is a great option. Just make sure that you won’t miss features like the lack of fax scheduling and no digital signatures.